The Islamic State has claimed responsibility for a suicide bombing at a military checkpoint in Lamitan, a city in the Basilan province of the Philippines. At least 10 people were killed and several others wounded in the blast, according to initial press reports. The so-called caliphate has posted a picture of the bomber, who is identified as Abu Kathir al-Maghrebi (seen above). The suicide bomber’s alias indicates that he is from the Maghreb and likely a Moroccan. 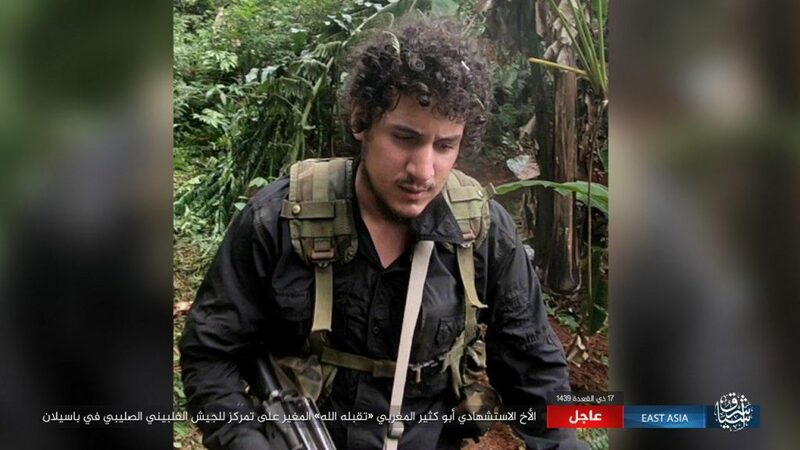 Indeed, pro-Islamic State Telegram channels said the “martyr” was from Morocco. According to CNN, military officials blamed the blast on the Abu Sayyaf Group. But this is not inconsistent with the Islamic State’s claim, as the Abu Sayyaf Group’s leaders and several of the group’s “battalions” previously swore their fealty to Abu Bakr al-Baghdadi. The Abu Sayyaf Group, which was once part of al Qaeda’s international network, helped the Islamic State grow in Southeast Asia, providing the self-declared caliphate with access to its local networks. However, the suicide bomber responsible for today’s blast wasn’t a local — at least not according to the Islamic State’s media team. The United Nations previously warned that the Philippines had become a destination for foreign fighters after the Islamic State captured the city of Marawi in May 2017. The takeover of Marawi was orchestrated by the so-called Maute Group, another local jihadist outfit that fueled the so-called caliphate’s expansion in the region. Despite losing control of Marawi several months later, the Islamic State remained a threat in the Philippines. What exactly did the u.n. think should be done? Do they really believe that the local government should have done nothing, so that the terrorists wouldn’t have “publicity value”? The level of that stupidity is mind boggling! The rest of those foreign idiots would have been on the way no matter what. The u.n. is a defunct organization, run by countries who don’t pay crap. We should shutter the building in N.Y.C. and send them all packing to Europe, where socialists and liberals abound. Good riddance! Interesting guy, interesting perspectives. He’s got an Ebook on the way, but I don’t know how much I can say about that either…I’m sure people that follow these stories like the one above will know it when they see it. It kinda covers the more “global” side of the ISIS fight when it comes to Special Mission guys and the programs in place to allow them to finally put a dent in other related Islamic Terror Groups (ITGs) in other flashpoints you’re seeing in the world today! We both read this article again together yesterday and just laughed about how these a-holes in AQ and IS have no clue how bad things are gonna get if Trunp’s SecDef and Agency heads get their way during a second term…I’m not pro nor anti Trump, just saying. He’s not gonna micromanage JSOC, and that was a huge plus to Bush Jr with me being non-political and very independent as a voter, as even Rumsfeld was kinda “blehhh” without his suboordinates telling him who to put in the priority target packages.